Cook with lean meats like 93-percent ground beef, lean ground turkey or chicken. Limit processed meats like hot dogs, bacon or deli meats, which contain a lot of fat. Substitute smoked turkey for bacon in recipes. Go “skinless” on poultry and trim all visible, solid fat from meat. Drain fat from ground-meat crumbles. Brown meat, poultry and seafood in a nonstick pan with cooking spray or small amounts of oil. 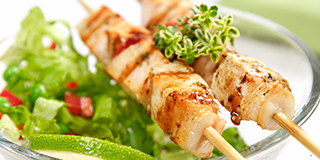 Marinade meat, poultry and seafood with marinades containing little-to-no fat. Grill, broil or roast meat and poultry on a rack so fat drips off.For more healthy BBQ tips, check out ACI’s newest YouTube video on healthy BBQ’s. This entry was posted in All Blogs, CORE Wellness and tagged ACI Specialty Benefits, core wellness, corporate wellness, EAP, Employee Assistance, employee assistance programs, employee benefits, healthy barbeque, Memorial Day, summer bbq tips, Wellness. Bookmark the permalink.